Splatoon is, for all intents and purposes, a strong multiplayer-focused shooter. The game twists the rules of conventional shooter mechanics by making you paint arenas rather than just shoot enemies, with Turf War rewarding the team that manages to spread their colour around the most. But it’s not the only trick the Splatoon pony knows. Once you get enough game time under your belt (enough to reach a level 10 Inkling, that is) Splatoon begins unlocking more online modes for you to play with. One of those new modes is Splat Zones, which plays on the Turf War formula a little bit. Instead of painting the entire map, players will have to strategically paint certain areas at certain times throughout the match. So think King of the Hill, except you’re painting an area rather than just standing in it. This, and a few other game modes, make up Spaltoon’s ranked online play, which will track the best teams of inklings from around the world. The persistent levelling will unlock new modes for you to play, as well as cosmetic items for you to kit your Inking out with. It’s a serious multiplayer focus on a Nintendo exclusive that, at a glance, looks like a game only suited for younger players. If you’ve had the chance to play though, you’ll know that’s a short sighted assessment. The only thing about Splatoon’s rather addictive multiplayer that has me depressed is the lack of online chat. With a game that requires some sort of co-operation, excluding any form of communication with teammates seems like a grave oversight. That, and I won’t be able to hear Geoff swear at me when I dominate him online. 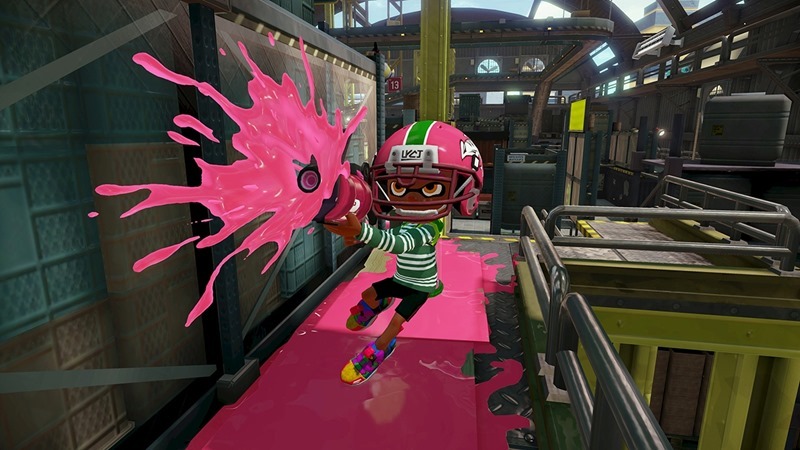 Regardless, Splatoon still looks like a solid new IP for Nintendo, and we’ll all get to see for ourselves in May.